Be a part of a group of Pimmit Hills residents who care about the environment in our community. Looking for volunteers for the activities and also people willing to help organize events/projects. Join our mailing list to share your project idea. Did you know there are 7+ parks in Pimmit Hills? Check our Pimmit Hills parks map to see if you know them all. 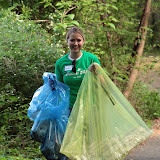 Help clean our local environment with a stream cleanup and invasive plant removal along Pimmit Run. Help beautify the stream that our community is named after! We will be picking up trash and removing invasive plants, so wear warm clothes that can get dirty. Bring a water bottle and work gloves. Some extra work gloves will be available, and trash bags will be provided.